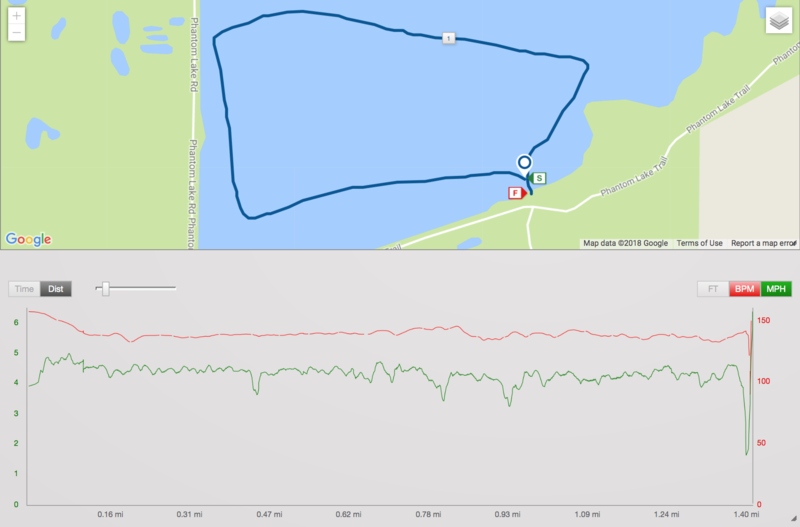 The Grantsburg Tri is a fun, low key adventure triathlon in the small town of Grantsburg, Wisconsin. The main event is a 19 mile bike, 1.5 mile kayak and 8 mile run – in that order. Last year I took 4th place overall after leading the bike, dropping a place on the kayak and then dropping 2 more places on the run. I went into it this year, really not knowing how the run was going to go, since I hadn’t run in 3 weeks. I did have 1 short jog in there to see how my foot was doing, but that was it. I was dealing with a small bout of potential Plantar Fasciitis and was saving my foot for the Tri. It worked out, just because my general fitness is really good. However, my general fitness will let me run a little harder and longer than my running muscles and joints are really ready for, which I paid for the next couple of days. 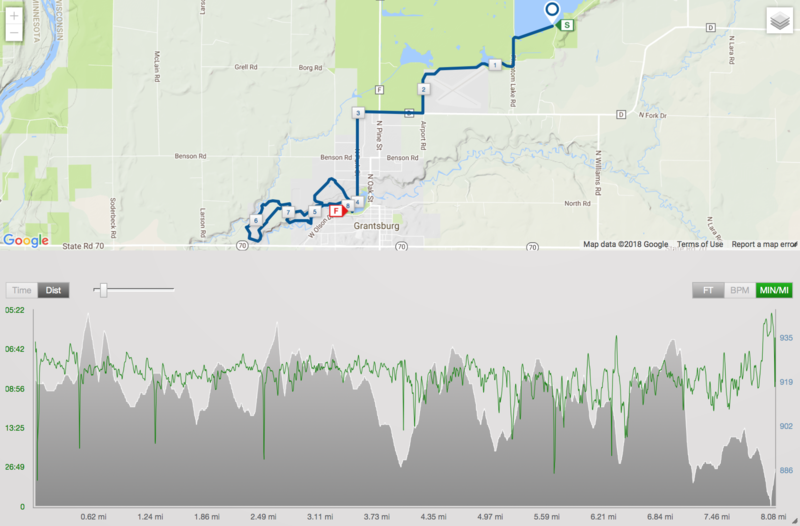 I usually include details prior to getting into the race report, but my course images are within each section of the race. 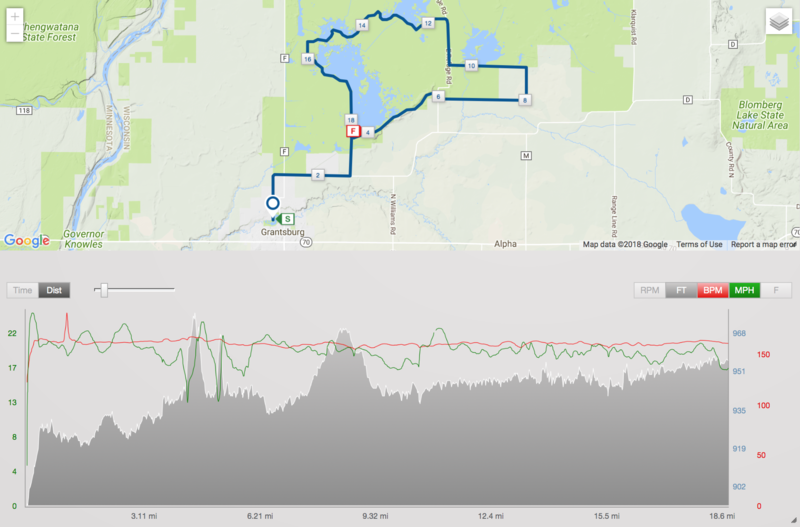 But, in short… The race starts with the bike at the local park in Grantsburg where the start and finish are at. You finish your bike out in the Crex Meadows area where you leave your bike and complete the kayak portion. Note: you staged your kayak out there in the morning. After the kayak, you run and finish the run back where you started the bike with some detours. I’ve heard people say they wish the staging areas were all in the same place. But, this is probably the best way to work this one out as it is nice to have the start/finish area in the park, since there are actual facilities at the park. You just have to go back out to the staging area after the race to pick up your bike and kayak. A gravel bike is by far your best option here, but I don’t own a gravel bike yet. I’m holding out and waiting on one of those new Trek Checkpoints. Anyway, I used my Trek ProCaliber, which worked out just fine. I used the stock XR2 2.2″ Cross Country tires on it that were set up tubeless with a fairly high air pressure (that I can’t quite remember at the moment). I left my Altra Superior running shoes in my kayak and swapped my shoes during the kayak portion of the race. I did not use bike shorts with a chamois, since the bike was only 19 miles. I just used some lycra running shorts, but still wore my bike jersey because I find the back pockets handy. My kayak is more of a day tripper kayak, so not the fastest… But, also not the slowest. I’m trying some new stuff this year and going back to some old stuff. I had one water bottle with Scratch mix in it on my bike that I completely finished. I also took a GU gel near the end of the bike segment. I had a water bottle with plain water in the kayak to wash down the previous gel and hydrate for the run while I was paddling. During the run, I took down another gel and then just grabbed water and gatorade at a few aid stations on course. The start goes off in waves. The first wave is the folks doing the race as a relay team, then there are multiple waves that follow with folks doing the individual race. I was in wave 2, the first wave of individual racers lined up next to Ben Mullin and Greg Atkinson, with Greg being the favorite to win the overall. There is also no drafting allowed in this race. We started to roll off the start line and I didn’t get very far before I noticed Greg and Ben beside me dialing up the effort and I decided to go on the attack immediately. Any gap that I was going to put on them would have to be on the hills or gravel and we wouldn’t hit much gravel until a few miles into the race. This first section of the race was a long gradual uphill and I figured I should take advantage of it. I pulled away fairly quick and stayed on the gas all the way up the hill and through the sandy corner to immediately pull a big gap on them. Once out on the pavement, I don’t think I put anymore gap on them as they were on gravel bikes while I was on knobby mountain bike tires. Ben might have even reeled me back a little bit on the pavement. By the time we were approaching Crex Meadows, I was coming up on some of the wave 1 folks. I think the 2 track section was likely an advantage from my end with a mountain bike. After the 2 track section we had some more pavement, which is where I knew I could quickly lose my gap if I didn’t stay on the gas. I never really pinned it though and kept my effort to about what I would do for a 3 to 4 hour mtb race, with my heart rate averaging around 161 bpm over the entire bike ride. Out on the pavement after the 2 track, I caught the leader of the wave 1 relay riders. I stayed pretty aero for most of the ride by staying tucked in and gripping my bars, just outside of the stem. I’m running a 1 x 12 GX Eagle drivetrain with a 34 tooth chainring, which was putting me back and forth between my 10, 12 or 14 tooth gears in the back. I may swap out my 34 tooth ring in the future for a 36 tooth ring as I don’t think I’ve had to use the 50 tooth gear out back yet. Anyway, I tried to maintain my gap on the pavement and then tried to maintain that same pace once I hit gravel. I was hoping the gravel would level the playing field a bit between the gravel bikes and my mountain bike. I do think I increased my gap on the gravel some more. I downed a GU gel near the end of the bike and hit the kayak with a nice lead… Almost 2 minutes on Ben and almost 15 minutes on Greg, who had a flat and was now riding a disfunctional Walmart bike that a spectator had passed on to him to finish the ride. However, I did not know that had happened at this point and assumed he was a few minutes behind. I had my running shoes and a bottle of water already in my kayak, which was waiting in the water for me. I got confused shortly though on my way to the water as I swear I saw my kayak still sitting up on shore in the staging area. I think they rearranged the kayaks after we staged them because there was an orange kayak that looked just like mine sitting in the very place that I had left my kayak in the morning. Anyway, short confusion, only seconds and then I realized my kayak was infact in the water waiting for me. They have a volunteer about a quarter mile from the finish of the bike with a radio, that calls the upcoming racer #s to the staging area, so they can get your kayak in the water and ready for you. I jumped in and they pushed me off. Last year I had not kept a steady push in the kayak, but I was determined this year to not waste anytime. Before I made the first turn, I saw Mullin in the water and on the chase. He was in a faster kayak and I did not want to let him catch me before the run, I wasn’t sure I could hang with him on the run if we were to hit the run head to head. Between paddle strokes, I managed to reach down and pop the BOA clamps on my shoes and then was able to kick them off in the kayak while I was still paddling. I also was able to reach down quick and orient my shoes so that I could get toes in them. I only had to reach down again and pull the heel of my shoes up and I was good to go, other than stopping to tie them once on shore. I’m pretty sure Ben put a little bit of time on me in the water other than the few seconds that the clock shows. I only had to quickly tie my shoes, but I think I remember Ben saying afterwards that he still had to swap shoes on shore, so he likely made up a little time over what the clock actually shows. I took off on the run feeling ok… As I mentioned above, I hadn’t run in 3 weeks other than a short jog about 2 weeks prior. I was concerned about some potential plantar fasciitis, but nothing was creeping up as I took off on the run. It was exciting to be in the lead still at this point, but I also knew that Greg would likely be running me down around the mid-point of the run. I also knew too, that Mullin had been doing some running and was nervous he might be able to run me down also. My only hope was that I stretched him out enough on the bike to fatigue his legs. Everything seemed to be working as I headed down the gravel road until I made the left hand turn onto the short pavement section. My hamstrings locked right up on me and I was doing a straight legged walk. I wasn’t really sure what to do at this moment other than try to walk them off. I figured I didn’t have much time to waste though. Part of me was thinking there was no way I was going to make it the full 8 miles with these types of cramps only a few hundred yards into the run. As soon as they started to relax, I slowly started jogging again and ramping my pace back up. I made my right hand turn onto the sandy 2 track that would wrap around the airport. I got a little ways down the 2 track and the cramps came back again. I thought it was game over for me at this point. I walked them off shortly until they relaxed and then started back up with a trot and then back to running again. You can see in the graph above the various places where my pace spiked down… Not all of them were the cramps though. The one around the 2.5 mile mark was when I stopped to grab a cup of water and cup of gatorade at the aid station. Again, around the 4 mile mark I stopped shortly to grab more water and gatorade. I made it through the sandy section and was out on pavement. As I headed down the road, I could see Ben back in the distance and knew I needed to keep my pace up. I made the left hand turn through the sandy corner that was near the start of the bike earlier in the day to start my gradual downhill back toward the original start line in the park. This is where the final 4 miles of the run hits the old ski trails. I looked back a few times and thought I saw Ben back there, but I think I put some distance on him as we came down the hill. It was at this point last year that Greg ran me down along with another runner. It was exciting to still be in the lead. It had not dawned on me yet that Greg might have had a mechanical. I thought with my fast ride and then not wasting any time on the paddle… there was a good chance I could hold Greg off for a couple of miles further than last year. When I hit the trails, I was starting to hurt. I was just feeling fatigued overall and wasn’t sure how these next 4 miles were going to shake out. The trail isn’t bad at first, but then gets hilly about halfway through with a few almost hiking pace hills in the final couple miles. I had my leg cramps fire back up at some point and had to walk them off. They were kind of going in and out after that and I would dial my effort back slightly depending on the terrain, to possibly avoid a full cramp up. Around 6 miles in, I was really starting to look for Greg… It was at this point that I started wondering if he might have had a mechanical. About 7 miles in I was sure that he had a mechanical on the bike and then realized I could actually win this thing. Even if Greg had not had a mechanical… I certainly didn’t want to give this thing up in the final mile and I started creeping my pace up as much as I could. I came out in a straightaway flat stretch along the river and saw a few RVs. I knew I was close and I couldn’t see anybody behind, but I still ramped it up and ran for the finish as fast as I could. I ended up crossing the finish line in 1st place at 2 hrs, 18 mins and 50 secs with Greg coming in 2nd at 2 hrs, 21 mins and 30s and Ben finishing 3rd at 2 hrs, 23 mins and 18 secs. Greg had actually completed the run segment almost 9 minutes faster than me. Running is so strange for me now that my fitness is really good all around. I seem to be able to run harder or longer from a cardio respect than what my legs are really ready for. I’ve got a good engine, but if I’m going to run, I really need to do it more often and start slowly ramping my miles up or I’ll end up hurting myself. I never got off my feet the rest of the day until going to bed after midnight and I paid for it the next day. I could barely walk the next morning when I got out of bed. My legs and hips just weren’t prepared for an 8 mile run. Anyways, I’m doing the Wilderman in July which is an Iron Man distance offroad triathlon, which I’m not ready for. I really like riding my bike, so as much as I want to try this multi-discipline stuff out… I’m not sure how far I’ll take it. This is a fun event regardless though, even if I don’t get into the multi-discipline sports.